There are dozens of ways to use literature and movies to cultivate children’s empathy, open their hearts to care about others, as well as to expand their cognitive development and enhance academic achievement. A big secret to cultivating this habit is to make the activity fun as well as meaningful to children while matching material to their abilities and interests. Do ask your child every once in a while: “When’s the last time you read a great book?” If your son or daughter has a blank look, then you know you need to work harder to make reading pleasurable. From my book UnSelfie: Why Empathetic Kids Succeed in Our All-About-Me World, here are a few ways to instill a love of reading in our kids. Make books available! Studies show that the more books you have in your home, the greater the chance your kid will become a reader. You don’t have to break the bank, but you should have available the type of reading material that elevates empathy. Dig out that library card. Take advantage of garage sales and buy gently used books. Set up a book exchange with the neighbors. Listen to audiobooks and then read the book as a family! Always stash an extra book in your child’s backpack and your car for those “just in case” reading moments. Tailor material to your child’s passions. A big secret to engaging kids in reading is to find material with a theme your child identifies with. If your daughter loves horses, Black Beauty or National Velvet might be the perfect match. Films like The Boy in the Striped Pajamas, The Book Thief, and Extremely Loud and Incredibly Close, or books like Where the Red Fern Grows or Bridge to Terabithia, can cause even a tough-skinned older kid to melt. To find the right selection for your teen, consider these online resources: Your Favorites: 100 Best-Ever Teen Novels, which is based on over 75,000 votes on best young adult novels, or the Empathy Library, the world’s first online guide full of recommended empathy-building books and films. Match the book to your child’s reading level. If your goal is to instill a love for reading, don’t push a book too hard. Most educators suggest you choose books for kids’ reading pleasure that are slightly below their academic level. Check the last report card or reading achievement scores for his or her reading level. Or at the next parent-conference ask the teacher what your child’s current reading level is. The back of many children’s books lists the reading level: for example, RL 2.1 means “Second grade, first month,” and RL 4.2 means “Fourth grade, second month.” You must match the reading level so it is geared to your child’s tested reading ability, not his age or year and month in school. Find a good reference! If you have difficulty finding a selection for your child, ask a children’s librarian. They are wonderful resources for this kind of information—and they love to be asked! Also, check resources of great books kids like to read such as Scholastic’s national yearly survey of six- to seventeen-year-olds, “Kids and Family Reading Report,” which is a portal leading to many guides of many books from all publishers, not just those of Scholastic. Quick-Picks is another resource, or ask other kids for book ideas. You might also treat yourself to a great reference that lists kids’ top reading choices, such as: Best Books for Boys: How to Engage Boys in Reading in Ways That Will Change Their Lives: K–8, by Pam Allyn; Best Books for Kids Who (Think They) Hate to Read, by Laura Backes; Books Children Love, by Elizabeth Laraway Wilson; How to Get Your Child to Love Reading, by Esm. Raji Codell; and The Read- Aloud Handbook, by Jim Trelease. 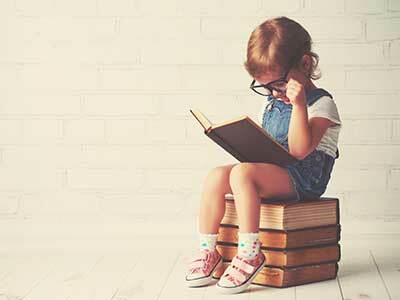 Just be sure to let your child have a choice in the selection: 89 percent of kids say their favorite books are ones they pick out! Don’t stop reading out loud! Around the age of eight is when our children generally stop reading for enjoyment. Ironically, it’s also when we typically stop reading aloud to them, so don’t stop reading aloud to your child. Find a book your whole family enjoys and use it as an ongoing read-aloud. Also, make sure your child sees you with a book in hand. Children who are more apt to be good readers have parents who read for pleasure. Hailed as “an absolute must-read” (Jean Twenge) and a book that “will change your kids’ lives” (Jack Canfield), UnSelfie by Dr. Michele Borba explains what parents and educators MUST do to combat the growing empathy crisis among children today—including a 9-step empathy-building program with tips to guide kids from birth through college, and beyond.Teens today are forty percent less empathetic than they were thirty years ago. Why is a lack of empathy—which goes hand-in-hand with the self-absorption epidemic Dr. Michele Borba calls the Selfie Syndrome—so dangerous? First, it hurts kids’ academic performance and leads to bullying behaviors. Also, it correlates with more cheating and less resilience. And once children grow up, a lack of empathy hampers their ability to collaborate, innovate, and problem-solve—all must-have skills for the global economy. 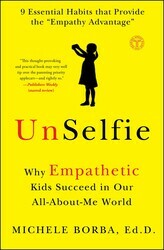 In UnSelfie Dr. Borba pinpoints the forces causing the empathy crisis and shares a revolutionary, researched-based, nine-step plan for reversing it. The good news? Empathy is a trait that can be taught and nurtured. Dr. Borba offers a framework for parenting that yields the results we all want: successful, happy kids who also are kind, moral, courageous, and resilient. UnSelfie is a blueprint for parents and educators who want to kids shift their focus from I, me, and mine…to we, us, and ours. Michele Borba Ed.D., is an internationally renowned educational psychologist and an expert in parenting, bullying, and character development. She is an award-winning author of twenty-two books translated into fourteen languages. One of the foremost authorities on childhood development in the country, she is a regular NBC contributor who appears regularly on Today and has been featured as an expert on Dateline, The View, Dr. Phil, NBC Nightly News, Fox & Friends, Dr. Oz, and The Early Show, among many others. She lives in Palm Springs, California, with her husband, and she is the mother of three grown sons.